Today Only: Free Shipping on orders of $49 or more! Just enter code CHWMEM in the coupon code box at checkout. Offer expires at the end of the day Monday, May 23, 2011. Start shopping now! Today Only, Shorts and Capris are only $14, or $20! Stock up and Save! Shop Here. 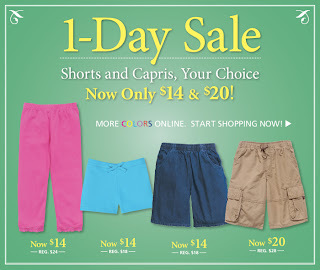 Sale expires at the end of day 5/18/11. Take an EXTRA 25% Off All Sale Items Today ONLY! (5/13/11). Just enter code CHW25P in the coupon code box at checkout. 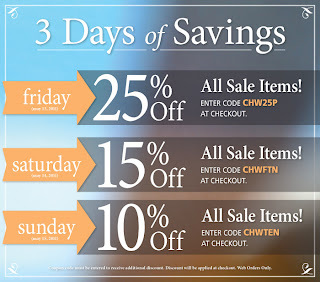 Saturday (5/14/11): Take an EXTRA 15% off all sale items. Enter code CHWFTN in the coupon code box at checkout. Sunday (5/15/11): Take an EXTRA 10% off all sale items. Enter code CHWTEN in the coupon code box at checkout. Click Here to Shop All Sale. Enjoy! 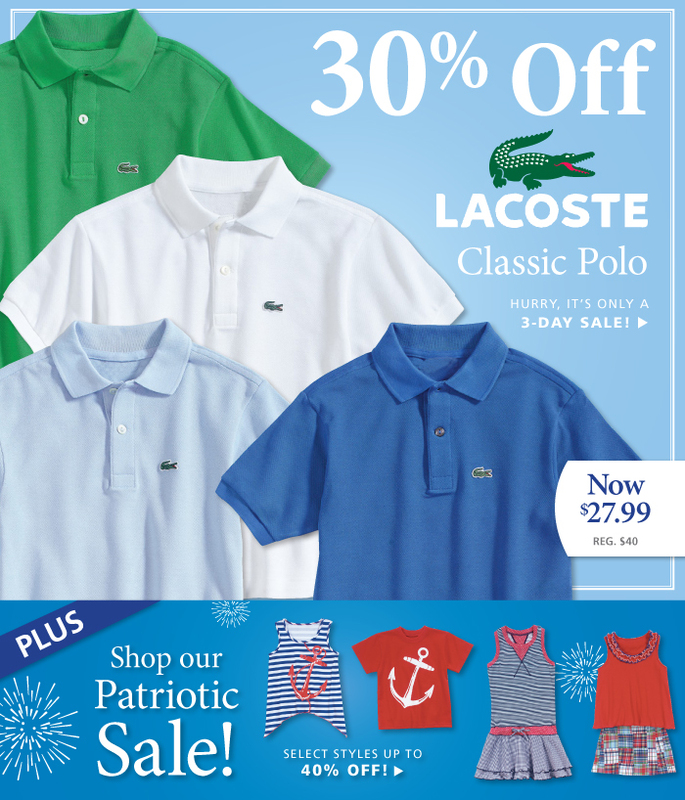 Lacoste collared polo's are only $27.99 for three days! Also, don't miss our Red, White, & Blue sale on select patriotic themed styles. Sale Expires 11:59pm EST 5/12/11. 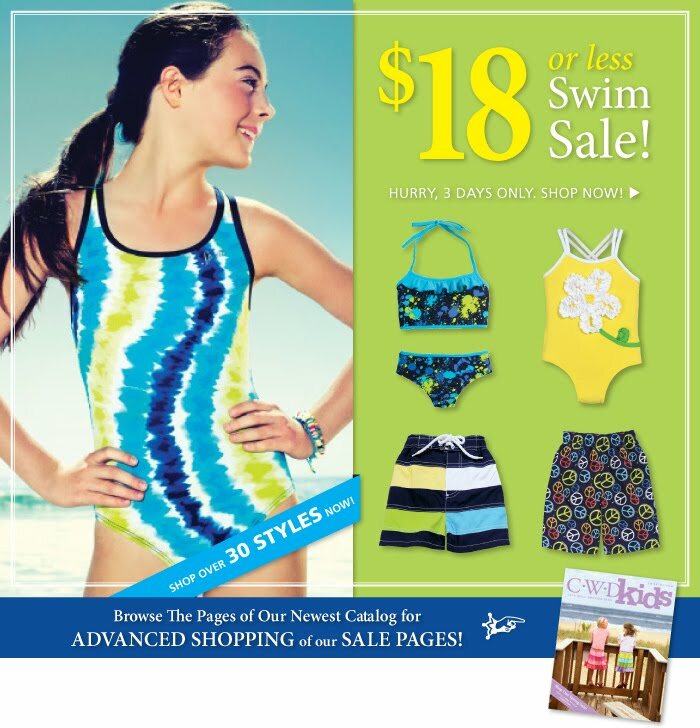 Shop over 30 Swim Styles for $18 or Less! Hurry, sale is only 3 days! Expires 11:59pm EST 5/8/11. 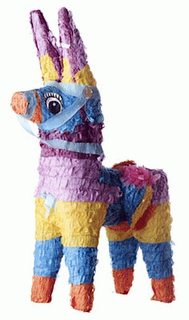 Celebrate Cinco De Mayo With Free Shipping Today- Ole! Enjoy free shipping on all orders over $49! 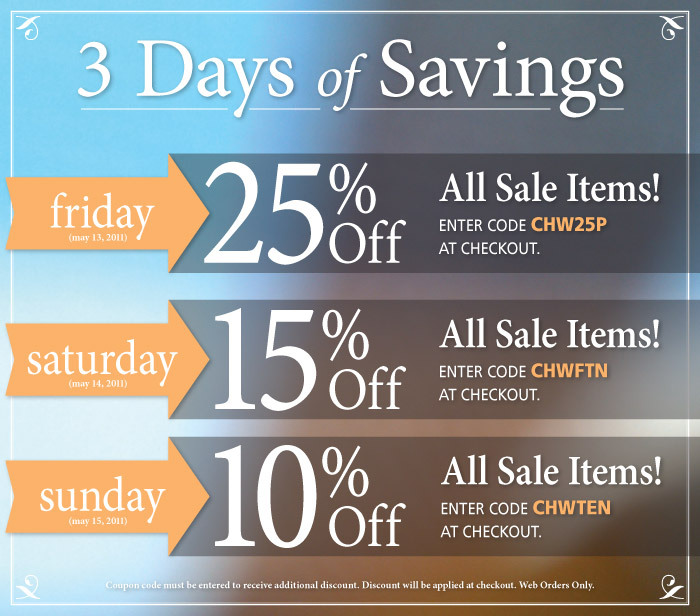 Please enter code CHWFCP in the coupon box at checkout. Offer is good only for the 5th of May. Last Minute Mother's Day Idea! Did you know that Mother's Day is this Sunday? 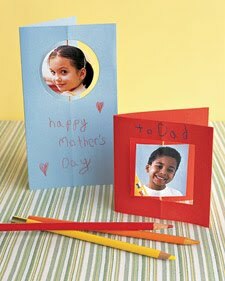 Yes, this Sunday... We have been scrambling around (the internet) looking for terrific ideas to honor our mothers and found this clever, super easy idea for an adorable Mother's Day card on Martha Stewart's website. Click here to find the instructions. We know mothers and grandmothers would love to receive this very special card on the big day!